The fee algorithm has not readjusted as intended following the dramatic increase in median transaction size which came with the upgrade to RingCT transactions. A conclusion reached on the subject has indicated that the dynamic block size penalty function does not work as intended when a typical transaction is close to the median block size. Would the existing block size penalty function work as intended if the median block size increased due to a higher number of transactions on the network and sufficient fees to pay for the necessary block size increase? What magnitude increase to the current transaction rate of 100 tx/hour would be required to achieve a satisfactory result? 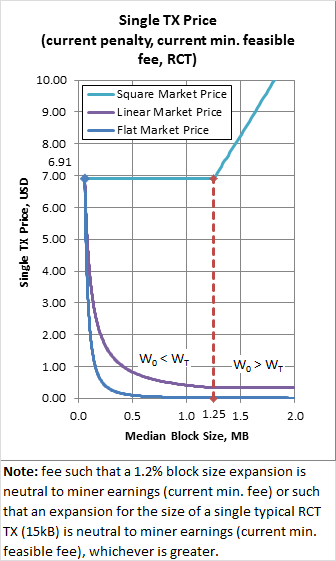 In theory, to smoothly function as "originally intended" would mean the median block size would somehow have to grow to the point where one TX is 1.2% of the median, which translates to a block size of roughly 1250kB (15kB being a safe size to fit a "typical" transactions). The magnitude would then be around 2500TX/hour or 0.7TX/s. It's a long way to reach that level of adoption. However, one needs to be careful when evaluating such things, because in practice we could see something entirely different. The 1.2% is a direct consequence of arbitrary constants chosen in the current min. fee formula. If it was chosen such that it's, for example, 2.4% then the tipping point would be at 625kB but the min. fee would be double then what it is now. Note: W_0 = 101.2%, W_T= (15kB) / (median block size) + 1. But what if the price also grows? Then we could end up having the same problem all over again. Long-term, if the price should raise with block size slower than linear, then it's likely we will never have this problem again in the future. It's just getting out of the trench which seems hard, and this trench shouldn't have been there in the first place! So it's not just the formulas which could help as dropping the market price 20-fold would also fix the problem. One could argue that if the network gets clogged and the price drops as a consequence the problem would fix itself. But I digress. If there was a consistent stream of TX-es coming in, then even with the current set-up the block size would be able to creep up slowly until it crosses over some point where the min. fee would drop so the users are willing to use higher multipliers. One could argue that was not the intended way the system should work and that at any given moment some would be willing to use at least some lower multipliers. Problem is that right now anything <20x does nothing of significance, because of the TX size issue. The dynamic block size is really there to accommodate some peak usage times and not have to wait days for backlog to be cleared. Thing is, the RCT HF introduced bigger TX-es but did nothing to address these dynamics at the same time. I understand that there was the thought that people would still be using non-RCT TX-es which would alleviate the problem but the reality is that more than 99% of TX-es are RCT even though it's not mandatory! At the end, we see that it's also about the price of min. fee at which miners can do something. The current min. fee gives no incentive to miners to do anything because of the TX size issue and yet it could already be considered pricey. Nobody wants to pay x20 the min. fee and make miners do something because the min. fee is high enough by itself. So really, there are many aspects to this and many possible solutions. We'd want to pick the one which would let us forget about the problem forever :) However, as the project is still in some early stage, these kind of details must be worked out and evaluated as we go on. The only worthwhile data which could be used as a guideline is the one for Bitcoin, and Bitcoin is also in some early stage, having its own problems and trying to work them out. Not the answer you're looking for? Browse other questions tagged ringct transaction-fees dynamic-blocksize-limit miners-penalty or ask your own question. How does the dynamic fee calculation work? Why is there a penalty on large block sizes? How does block time depend on number of transactions and block size? Reward penalty: how to control the block size? Does the dynamic blocksize limit and penalty function lead to a tragedy of the commons? How can block size grow over time when miners are incentivised to keep size small? Why will the v5 fork raise the min block size to 300,000 bytes? How does the dynamic blocksize and the dynamic fees work together in Monero?